Mike has been training in Aikido for almost 20 years. He holds the rank of Yondan (4rd degree blackbelt) as recognized by the Aikikai Hombu Dojo in Japan. He has been teaching Aikido at all levels for more than eight years. He is a certified Aikido Instructor (Shidoin). He is also a certified instructor in Aikido for Law Enforcement. 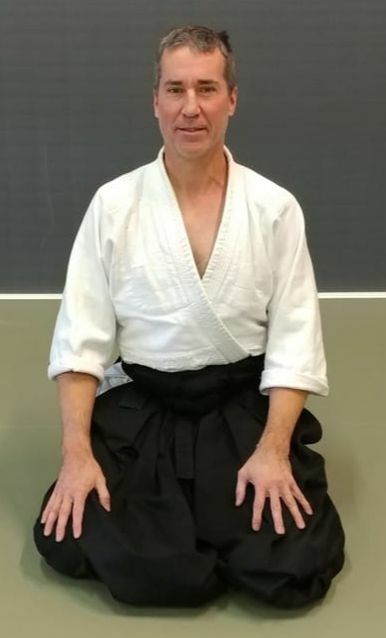 Mike regularly visits other Aikido schools throughout the country attending seminars and camps to improve his skills and knowledge of the art. Mike is a Krav Maga Instructor at Valley Forge Training Center. He also trains regularly in Brazilian Jiu Jitsu and is currently a blue belt. During the day, Mike is a Director with a local pharmaceutical company. He is married with four children. Mike has been training in Aikido for over 20 years. He holds the rank of Nidan (2nd degree blackbelt) as recognized by the Aikikai Hombu Dojo in Japan. Mike also holds a blackbelt in Tang Soo Do. During the day, Mike is Director Global Marketing with a local pharmaceutical company. He travels extensively in this role throughout the US and EU, which has afforded him the opportunity to attend various seminars and camps to improve his skills and knowledge of the art. He is married with one child. Matthias has been training in Aikido for over 16 years. He holds the rank of Nidan (2nd degree blackbelt) as recognized by the Aikikai Hombu Dojo in Japan. He is a certified Aikido Instructor (Fukushidion). Matthias also trains in Kendo. During the day he owns and operates his own home remodeling business, Fine Home Builders. Eric took his first Aikido class in 1980 as a 10 year old at a small Yoshinkan Aikido dojo in Philadelphia. Over the years Eric has studied Cuong Nhu, Wing Chun, and Boxing, but in 2011 Eric committed to the study of Aikido and has been in regular Aikido training ever since. Eric holds the rank of Nidan (2nd degree blackbelt) as recognized by the Aikikai Hombu Dojo in Japan. He is a certified Aikido Instructor (Fukushidion). 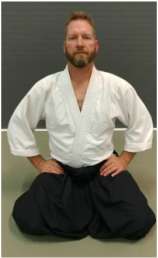 Outside of Aikido Eric has a Masters degree in Counseling Studies, works as an Operations Director for a large behavioral health company, and is the proud father of three. Bobby has been training in Aikido since 2009. Currently, Bobby holds the rank of Nidan (2nd degree blackbelt) as recognized by the Aikikai Hombu Dojo in Japan. During the school year, Bobby is a high school Computer Science teacher. Bobby is married and has 2 kids. Joe has been training in Aikido for over 7 years. He holds the rank of Shodan (1st degree blackbelt) as recognized by the Aikikai Hombu Dojo in Japan. Joe also holds a certification as a personal trainer from the International Sports Sciences Association. During the day he is a High School Science teacher as well as a coach. He is married with two children. Ron has been training in Aikido for over 8 years. He holds the rank of Nidan (2nd degree blackbelt) as recognized by the Aikikai Hombu Dojo in Japan. He is a certified Aikido Instructor (Fukushidion). At age 65, Ron is the most senior member of the Valley Forge Aikido family. He is living proof that regular training can help maintain a healthy body. During the day Ron is an Assistant Director with a local pharmaceutical company. He is married with two children.